Russia has released what it said were video confessions from sailors from three Ukrainian navy ships it had seized in the Black Sea on Sunday, as Ukraine voted to impose martial law in some regions in response to the incident. Russian coast guard ships on Sunday seized two small Ukrainian gunboats and a tug, accusing them of unlawfully entering Russian waters as they sought to cross a disputed strait that separates Crimea from mainland Russia. The Russian ships opened fire on the Ukrainian vessels before boarding them with special forces, injuring six crew, according to Ukraine’s navy, setting off a major new escalation in tensions between the countries. On Monday, Russia’s Federal Security Service, or the FSB, which detained the men, released three videos in which three of the Ukraine sailors appear and give accounts of the incident. (AP) Three Ukrainian ships are seen as they are docked after being seized on Nov. 25, 2018, in Kerch, Crimea, Nov. 26, 2018. It was not immediately possible to verify whether the men were who they said they were. Ukraine has yet to confirm the men’s identities. The men — all wearing Ukrainian military fatigues and seeming to recite memorized texts -- tell the camera they had known they were entering Russian territorial waters and they had deliberately ignored repeated requests by the Russian coast guard to stop. "We consciously ignored requests by radio to stop. I realized that the actions of the Ukrainian navy ships was of a provocative character," according to Lesov, who said he was aboard the gunboat, the Nikopol. The accounts were clearly intended to bolster the version of the incident that Russia has promoted -- that the Ukrainian ships had provocatively violated Russian waters and ignored reasonable requests to halt. On Monday, the Kremlin’s spokesman, Dmitry Peskov described the incident to reporters as "an invasion of Russian waters" and a "dangerous provocation." Ukraine disputes that statement and said that Russia had unlawfully blocked the ships and deliberately attacked them. The Russian account appears to be at odds with video that showed some of the incident and was shot aboard one of the Russian ships. 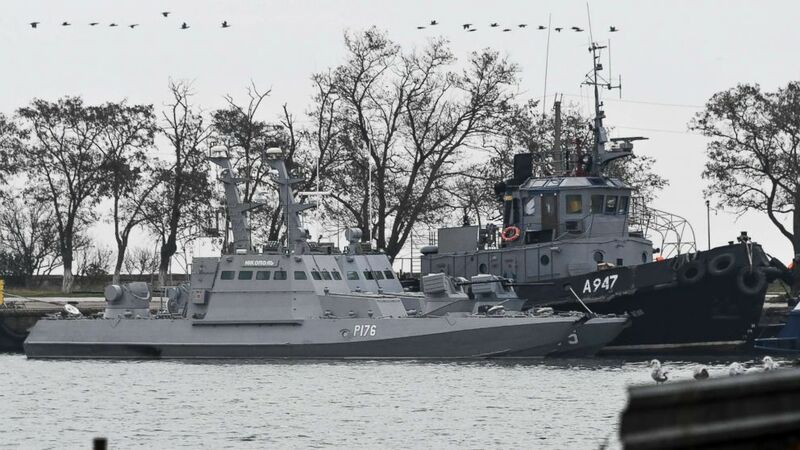 In the video, that was posted by Ukraine’s Interior minister, Arsen Avakov, the Russian crew can be heard enthusiastically urging on their boat to crash into one of the Ukrainian ships. In an expletive-filled monologue, a Russian crewman can be heard triumphantly directing his ship into the Ukrainian tug, with the Russian boat eventually slamming into its bow. (AP) A ship makes its way near to the Kerch bridge, in background, near in to Kerch, Crimea, Nov. 26, 2018. What will now happen to the men is still unclear. 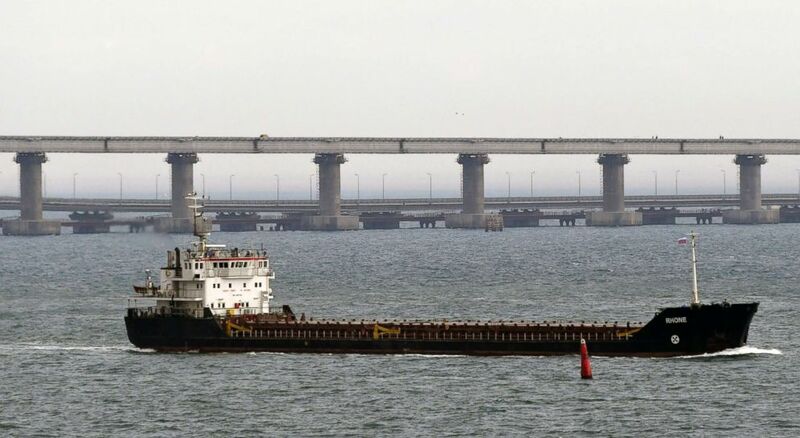 The three Ukrainian ships have been towed to the port of Kerch in Crimea. On Monday, Peskov suggested that Russia might prosecute them. "Border trespassers are prosecuted according to the law, in strict accordance with legislation," Peskov told reporters after he was asked whether Russia viewed the sailors as prisoners of war. Peskov said he was unable to answer that question, but noted a criminal case had been opened into the altercation. The incident in the Black Sea has prompted a wider international crisis, with the United Nations Security Council holding an emergency session on Monday to discuss it. It has also stoked political tension in Ukraine, where the country’s parliament voted on Monday to introduce martial law in some regions, citing the need to be ready in case of Russian attack. Sunday's incident was an escalation of a simmering dispute between Ukraine and Russia over the waters around Crimea, one that arose out Russia's annexation of the peninsula in 2014. 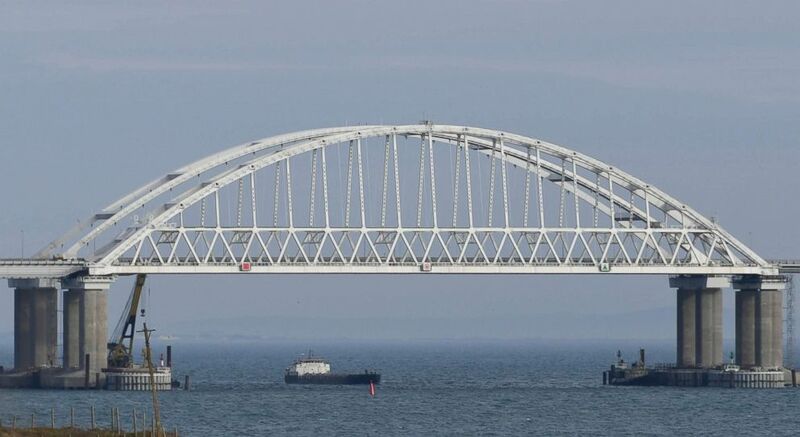 Ukraine has accused Russia for months of making it harder for its ships to pass through the Kerch Strait, a narrow stretch of water that separates Crimea from mainland Russia and which opens into the Sea of Azov. A 2003 treaty designates the strait and the sea as shared territory between Ukraine and Russia, but since the annexation Russia has exerted greater control over access to the strait, which Ukraine says amounts to a partial blockade. At the U.N. Security Council, the Russian request for an emergency meeting was voted down over concerns it was the aggressor in the incident. A session requested by Ukraine went ahead, with Western countries condemning Russia’s actions. Nikki Haley, U.S. ambassador to the U.N., condemned what she said was "another reckless Russian escalation" and accused Moscow of violating international law. (AP) The Kerch Bridge span is open for the passage of ships, near Kerch, Crimea, Nov. 26, 2018. In Ukraine, its parliament voted to approve a motion by President Petro Poroshenko to introduce martial law, though only after watering down his original request. The parliament, known as the Verkhovna Rada, voted 276-30 to introduce martial law in regions bordering Russia for 30 days. Poroshenko had initially wanted it to apply nationwide and to last 60 days, but the proposal had been met with skepticism from lawmakers amid widespread concern that the move was a ploy to postpone elections in March, in which Poroshenko is not expected to fair well. Instead, martial law will only apply in 10 of Ukraine’s 27 regions that are deemed at risk of Russian attack. Poroshenko, who has denied he would delay the elections, has argued martial law was necessary to ensure Ukraine was prepared in case of a Russian attack. "Martial law doesn't mean declaring a war," Poroshenko said after the vote, according to The Associated Press. "It is introduced with the sole purpose of boosting Ukraine's defense in the light of a growing aggression from Russia." Prior to the vote, Poroshenko had said Ukraine’s intelligence agencies had information there was a "serious threat of a ground operation" by Russia. 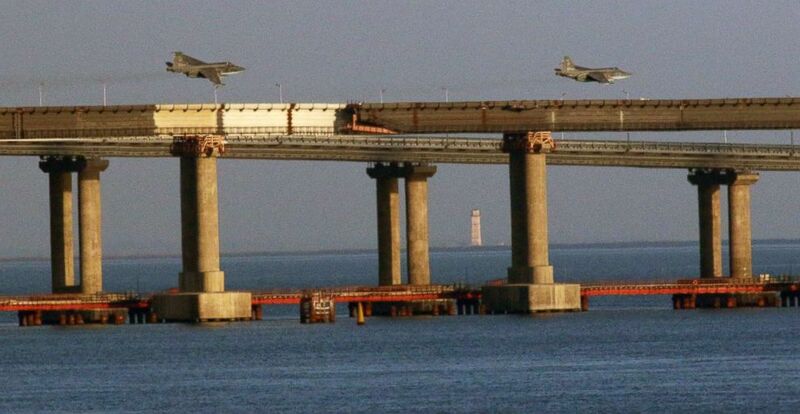 (Pavel Rebrov/Reuters) Russian jet fighters fly over a bridge connecting the Russian mainland with the Crimean Peninsula after three Ukrainian navy vessels were stopped by Russia from entering the Sea of Azov via the Kerch Strait in the Black Sea, Crimea, Nov. 25, 2018. The measures approved by the parliament allow for partial mobilization of Ukraine’s armed forces and for the strengthening of air defenses, but how martial law will now manifest itself remains hazy. Many of the proposals are vague, such as "strengthening" anti-terrorism measures and "information security,” the AP reported. Ukraine has not previously imposed martial law, even during the height of the conflict with Russia and Russian-backed rebels in its eastern regions, which has claimed over 10,000 lives.